For the past several months, I’ve been on a mission to get non-trail runners to give the trail a shot. I even released a free eBook outlining all the best reasons why you should, and a complete 101 guide on trail running basics (posted to the Art of Manliness blog). But what I haven’t done a great job of is following up with runners who have listened to all the prodding. Who maybe reluctantly, or hopefully enthusiastically, decided to ditch the pavement and hit the trails. If you know my story at all, you know that once my old roommate convinced me to try running one of the trails in DC’s Rock Creek Park, there was no going back. Immediately I was hooked, and it completely changed the focus of my training and racing. During those first several months of exploring the trails in and around DC, I had a sharp learning curve. I made a ton of rookie mistakes, and still have the scars to prove it. So that’s what I want to address today. The things I wish I knew when I first started trail running. After looking back on it, I landed on 13. Not so unlucky this time! 1) Start small and local: Trail running doesn’t mean multi-day mountain adventures 75 miles from the nearest cell tower. 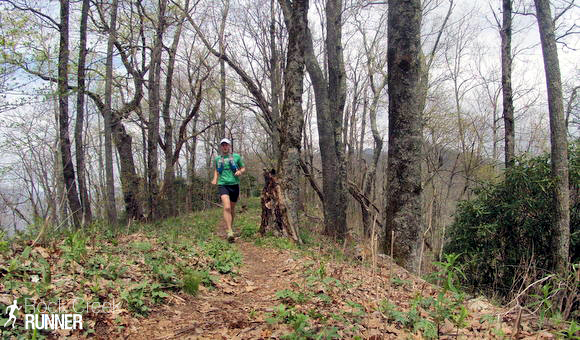 Most trail runners are running trails just a few miles from their doorsteps. Local, regional, city, and state parks often have miles of accessible trails perfect for new trail runners. They are typically well marked and maintained, and don’t adventure too far away from roads and access points in case you get lost. I’ve found the best way to find these trails is by searching for hiking, not running trails. LocalHikes.com and AllTrails.com are good places to start. 2) Pay attention to your time, not your pace: When someone asks about advice on going from road to trails, this is always the first point I bring up. Trail running is typically a lot slower than road running, so don’t get discouraged when it’s taking more effort to keep up your pace. For your first several runs, focus on how long you’re out on the trail instead of the distance you’re covering, and try to match the total time of your run to what you would have run on the road. 3) Follow the leader, or at least those with more experience: When you’re learning anything, it’s good to follow the lead of those who have more experience. Same goes with trail running. Seek out a friend or someone from a local running group to join you for your first few runs. That will cut down on the fears that may be holding you back, and will help encourage proper trail running technique. 4) But don’t follow too closely: A big mistake I see from beginner trail runners is how closely they follow the person in front of them. If you’re out running with someone else, keep a safe distance between you and the person in front of you. Slick trails, roots, rocks, and quick changes in pace can make following too closely dangerous. Always alert someone of where you’re going and when you expect to be back. Lift up your feet and pay extra attention to footing to avoid falling. Have a first aid kit on you or in the car in case of injury. Carry your phone if the trails you’re running have coverage. Carry a map if you don’t know the trails. Run with someone else when you can. 6) Horse trails are your friend: When you’re first starting out, wide, less technical trails are a lot more enjoyable and offer a good platform for learning trail running basics. An easy way to find wide trails is by searching for horse trails instead of hiking or running trails. Just watch out for the poop. Bonus Tip: Never run up behind a horse. Make sure the rider knows your coming, and pass carefully. 7) Carry water, even on shorter runs: While out on the trails, I almost always carry water. Depending on how well I know the trails, it may take much longer to finish than expected, so it’s good to have supplies just in case. I also find that the tougher climbs make me more thirsty than I would be on the same distance run on roads. I recommend a simple handheld bottle for shorter runs or a hydration pack for anything over 2 or 3 hours. 8) Be a part of the trail running community, it’s awesome: If you’re already a runner, you know how great the running community is. Somehow, the trail running community is even better. We’re known for being friendly, encouraging, beer lovers, and a lot more laid back than our roadie counterparts (sorry guys). Find a local trail running club in your community, or meet up with a group going for a morning run. Even if you’re a beginner, they’ll take you under their wing and help you learn the ropes. 9) Not all trail races are ultramarathons: There’s been a lot of talk about ultramarathons around these parts recently, but even though ultrarunning is trail running heavy, trail running offers races in all distances. The sport is growing, and so are the number of shorter distance trail races. Some of my favorite trail races ever have been at the 10 mile distance, and you can find races from 5ks to trail marathons. But don’t be upset if once you catch the trail bug, you end up obsessing over the idea of an ultra. Consider yourself warned. 10) Don’t forget to have fun with it: Trail running is fun. Lots of fun. But even when the workout is tough or a trail particularly difficult, don’t forget to have fun with it. After all, there’s simply nothing more playful than running through the woods, when it takes us back to the instincts we had as children. 11) It’s OK for your feet to get wet: You won’t melt. I promise. Blisters are a runner’s worse nightmare. They also happen to be something I struggle with all the time. But when you’re trail running, it’s OK for your feet to get wet. Mostly because they’re going to get wet whether you like it or not. Don’t stress yourself too much with trying to avoid puddles and creeks. Jump over where you can, of course, but a little moisture isn’t going to ruin your run and destroy your feet. Trail running shoes often offer very breathable and quick to dry material, designed to reset quickly after a creek crossing. Proper running socks also help. 12) You’re going to fall, but you’ll get better: When I first started running technical trails, I fell all the time. I’d come home bumped and bruised after nearly every long run. But over time, I found that I was falling less and less. I learned how to properly descend quickly on technical trail without tripping, and how to scan the trail for roots and rocks as I ran swiftly. As with any new sport, you get better, and tumbles become less likely to happen. Until then, just remember to lift those feet! 13) Embrace the new addiction: I hate to say it, but trail running is addicting. And it just might make you despise the thought of training on the road. And that’s just fine. Have fun with the trails and the community. Challenge yourself with new races and distances. By trying out trail running, you’ve opened yourself up to a whole new sport. Thanks for the great post Doug! I’ve run ultra distance races before, but I’ve never done any trail work and I am really excited to get going. One thing missing is a primer like you’ve provided here with some tips so I can get started knowing some of the basic unwritten rules. Good stuff. It is nice to know that I am not the only one falling down on my trail runs. 🙂 My secretary said it wouldn’t be such a big deal, but since I’m 6’9″ it is like falling a couple of stories! One thing I would add, not as advice but info, is the fact that trail runners seem to be (compared to road runners) so friendly, helpful, encouraging, and look out for each other. I ran a half marathon trail race with a friend who is a competitive road racer. It was his first off road race and he was blown away by the camaraderie of the runners. It made me appreciate it more.